Landmark study warns melting glaciers will exacerbate pollution and trigger more extreme weather. Two-thirds of Himalayan glaciers - the world's "Third Pole" - could melt by 2100 if global emissions are not sharply reduced, scientists have warned in a major new study. Even if the most ambitious Paris Agreement goal of limiting global warming to 1.5 degrees Celsius is achieved, one-third of the glaciers would disappear, according to the Hindu Kush Himalaya Assessment, which was released on Monday. Glaciers in the Hindu Kush-Himalaya region are a critical water source for some 250 million people in the mountains, as well as to 1.65 billion others in the river valleys below, the 650-page report said. The glaciers feed 10 of the world's most important river systems, including the Ganges, Indus, Yellow, Mekong and Irrawaddy. They also, directly or indirectly, supply billions of people with food, energy, clean air and income. If the ice melts, the consequences could include worsened air pollution to more extreme weather. Lower pre-monsoon river flows will disrupt urban water systems and food and energy production, the study warned. Five years in the making, the report was published by the International Centre for Integrated Mountain Development (ICIMOD) in Nepal, one of eight countries on the front line. More than 350 researchers and policy experts, 185 organisations, 210 authors, 20 editors and 125 external reviewers contributed to its completion. "Global warming is on track to transform the frigid, glacier-covered mountain peaks ... cutting across eight countries to bare rocks in a little less than a century," Philippus Wester, of ICIMOD, said in a statement. "This is the climate crisis you haven't heard of." The 2015 Paris Agreement vowed to cap global warming "well below" two degrees Celsius above pre-industrial levels, and to pursue efforts to limit the temperature increase to 1.5 degrees Celsius. In December, the UN climate forum agreed on a common approach to implement the accord, but failed to deliver fresh commitments to reduce planet-warming greenhouse gases. Voluntary pledges currently in place would see Earth heat up by more than 3C, a recipe for widespread human misery, say scientists. The new report notes that a 1.5C increase in global temperatures would mean a rise of at least 2.1C in the Himalayas region. If emissions continue unabated, the roof of the world would warm by an unlivable 5C. "This is a landmark piece of work," said Jemma Wadham, a professor of glaciology at the University of Bristol in England, who did not contribute to the report. "The discovery that a third of the Himalayan glaciers could disappear signals potentially disastrous consequences for river flows, pollution and managing natural hazards associated with extreme events for more than one billion people." The Himalayan glaciers, which formed some 70m years ago, are highly sensitive to changing temperatures. Since the 1970s, they have thinned and retreated, and the area covered by snow and snowfall has shrunk, raising concerns that glacial lakes could burst and flood. "Emerging hazards - in particular glacial lake development and increasingly unstable rock and ice faces -- will become a major concern," said Duncan Quincey, an associate professor at the University of Leeds school of geography. Air pollution from the Indo-Gangetic Plains - one of the world's most polluted regions - also deposits black carbon and dust on the glaciers, hastening melting and changing monsoon circulation, the ICIMOD study said. The region would require up to $4.6bn per year by 2030 to adapt to climate change, rising to as much as $7.8 billion per year by 2050, according to an estimate in the report. 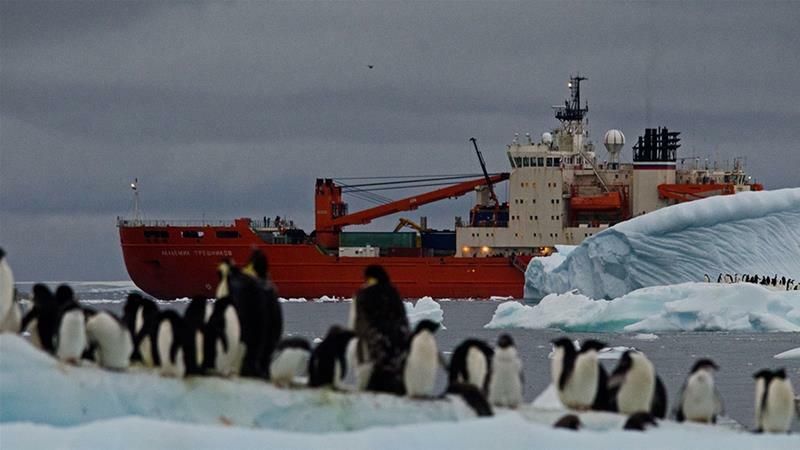 "Without the ice reserve in the mountains to top up the rivers through the melt season, droughts will be harsher on those living downstream," noted Hamish Pritchard, an expert on ice dynamics at the British Antarctic Survey, commenting on the findings.